Aprons not only protect cook and chef clothing and uniforms from hot food splashes and drips, but they also provide a professional look for your servers and wait staff. 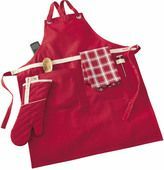 Bib aprons, waist aprons, and dishwasher aprons all serve specific functions. Your entire foodservice staff should have apparel that creates a clean, professional presentation and a consistent look that you select. From the head chef to the line cook and from the hosting staff to the servers and bussers, choose the apparel that is durable, safe, and sharp looking. Coats, shirts, pants, hats, and clogs are available. Commercial grade pot holders and oven mitts allow your cooks and wait staff to remove hot pots and pans from the range top and from oven compartments. Also includes oven sleeves. Made from heat resistant materials. Pot handle covers are heat safe and designed to slide on to most commercial pan and pot handles.